Fred Braithwaite has been swimming with dementia in Durham since July 2015 and always attends the sessions with his wife, Jean. Fred is 86 and Jean is his full-time carer. 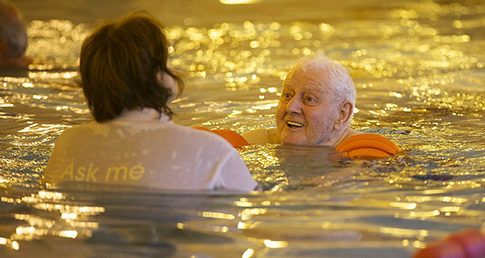 They have both been attending Dementia Friendly Swimming sessions at Teesdale Leisure Centre in Barnard Castle. The couple first heard about Dementia Friendly Swimming from a Durham County Council Summer guide booklet which they received through their door and not long after that there was an article about the project in their local newspaper, the Teesdale Mercury. He has fond memories swimming with his friends in the River Wear on Durham Big Meeting Day, which was an annual event he enjoyed going to. The first time he swam in an actual swimming pool was when he was a teenager, in Durham Baths. Before joining the Dementia Friendly Swimming sessions, Fred hadn’t been swimming since his last family holiday 5 years ago, which was just before he was diagnosed. They decided to give the sessions a go because they knew that Fred had always enjoyed water and it made him feel relaxed. Jean on the other hand has never been a strong swimmer. She got pulled under when she was around 16 years old and has been frightened ever since so naturally she was a bit apprehensive but still wanted to give it a go for Fred. To begin with they were both nervous and didn’t want to let go of the side or take their feet off the floor. The swimming teacher was very nice; he offered encouragement and advice and showed them how to use different types of floats. He taught from the poolside and would walk up and down next to them. Then in January 2016, there was a change in swimming teacher. The new teacher Julie York took a different approach to the sessions and would get into the water with Fred and Jean each week. Jean said “It’s been brilliant! Having Julie has made a big difference.” She described Julie as lovely, saying she supports him and makes him feel comfortable. With the one to one support in the water, Fred has made a big improvement and is now swimming a little bit on his own,and Jean has improved as well. Jean and Fred both agree that the staff at Teesdale Leisure Centre are very good. Not only is Fred attending a weekly Dementia Friendly Swimming session at Teesdale Leisure Centre but he has also recently joined the gym which he also tries to do on a weekly basis. “We asked about it” said Jean “as he just wanted to be more active. “We’ve tried going to other groups like singing for the brain in the town but he likes coming here” Jean doesn’t come to the gym with Fred however, he attends with a carer and the staff support him to use the bike and arm cycle. When asked what she would say to others to encourage them to take part in Dementia Friendly Swimming, Jean said “It might seem like a chew. It is difficult getting here, getting changed and getting in the water but it helps. I’ve seen the benefits in Fred and it’s better than sitting at home”. Jean went on to describe those benefits; explaining how Fred enjoys being in the water. It relaxes him which makes a difference. He’s happier and it makes a difference in his temper not only while he’s swimming but for the rest of the day. That in turn makes a difference for Jean meaning that she has a better day. The other benefit is that swimming tires Fred out so he sleeps better after he’s been. 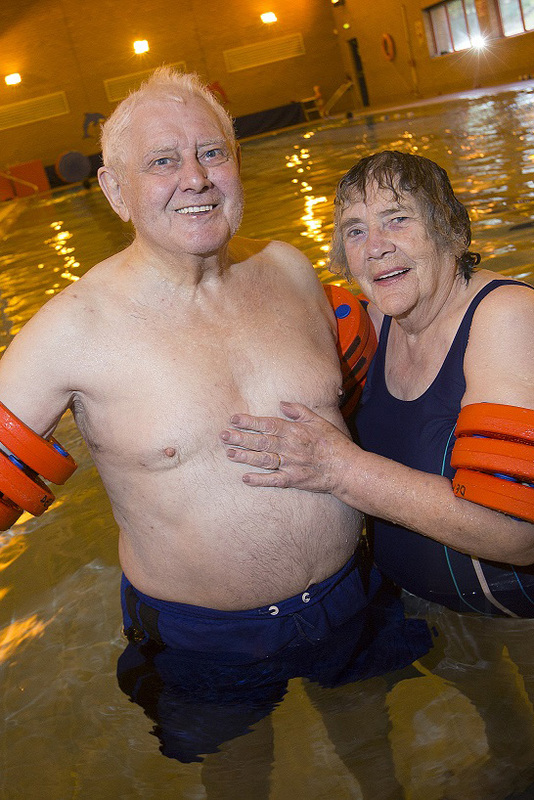 Fred and Jean hope to continue attending Dementia Friendly Swimming in Durham for as long as they can.